I got an email recently from a runner (let’s call him Jim) who had just started wearing a heart rate monitor during his training. Jim was concerned because at 56 years of age, his maximal heart rate was “supposed to be” 164 beats per minute (bpm), yet during his threshold run he managed to get his heart rate all the way up to 172 bpm. Was Jim putting himself in danger by exerting himself too hard? Of course not! Theory is for science; practice is for living. What do I mean by that? Simple, Jim’s theoretical maximum heart rate is 164, but in reality he got all the way up to 172 (which for the record is definitely not the fastest his heart could beat.) Instead of assuming that something is wrong with Jim, maybe something is wrong with the chart that told him he couldn’t get beyond 164. Don’t be afraid to question things, people! The heart rate charts that appear in many fitness books and manuals that come with heart rate monitors are antiquated and based upon the fallacy that as you get older, your heart gets weaker. This might be true if you spend your entire life sitting at a desk, but if you are an active person, there is no reason why your heart can’t be just as strong at 56 as it was at 26. The other major problem with the chart (and with all charts of its nature) is that it assumes all people are identical! There is no one thing that is best for everybody and heart rate ranges are no exception. So how do you find your target heart rate? I have a very simple test. If you have a heart rate monitor it will help, but you can do this test as long as you have two fingers and a pulse. First, warm up with one or two miles of easy running, then step up your pace a little bit for another mile. Once you have a good sweat going and your heart is pumping, sprint as hard as you can for as long as you can! Then check your heart rate. Add 5 to that number, and that’s your max heart rate. Oh and don’t be foolish. If you have a heart condition or if you’ve never run more than a mile, don’t try this test just yet. Can you check it out doing wind sprints? For example, on my most recent wind sprint workout, I did five flat wind sprints, and then five hill sprints. According to my HRM, on my last sprint, I got it up to 100% of my max (I'm 39). If I just add five to that, would that work? I couldn't have run any further, any faster! Wind sprints are probably an equally effective way to gauge your max heart rate. Pretty much any prolonged activity where you are pushing yourself as hard as possible will do the trick. The idea to add five simply comes from the fact that most people will always hold back just a little bit unless we are in a real life or death situation. The chart may in fact be accurate for you at this point in your training, Jeff, but as you get older (especially if your your fitness level improves) it may not be anymore. These charts are crap. I get my HR over 200 frequently. Good call Al. To each his own I guess. I never check my heart rate……well I do check my resting heart rate every now and then = 50. I just run and/or sprint a couple times a week, barefoot or Vibrams of course. This is the greatest benefit of paleo life I think, not having to “over” exercise to lose or maintain weight. But, I guess if running is your “thing” then max heart rate could be a useful tool. I agree that monitoring your heart rate during exercise is not necessary. But like you said, it can be a useful tool. I use it generally to avoid what Mark Sisson calls the “chronic cardio” part. I push myself generally, so if I'm not careful, I'll just push harder and harder. I think the HRM serves a useful purpose for that. When I sprint, I like to use it to push myself harder. It's a challenge, can I hit 100%? How about 102%? I don't use it otherwise. Indeed. I've not succeeded yet. 100% was my highest, and it was on my last, and I almost puked, so I didn't feel the need to try harder! the natural aging process of the human body. You missed the point of this article. Of course a fitter individual should have a lower resting heart rate than someone who is less fit. 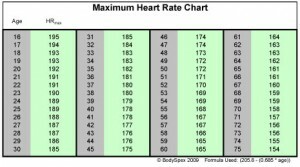 According to the charts, however, a man your age should’t be able to get his heart rate above 173 – and yet you just told me you got your heart up to 175 during your recent workout. Do you see what I’m saying now? Al isn’t talking about how fast your heart beats; notice he used the words how strong your heart is. Basically, the heart rate chart is an attempt at a one-size-fits-all solution. However, because of statistical averages and variations in peoples’ lifestyles, you shouldn’t be so fixated on what the chart says. And, of course, as he points out, anyone in poor physical condition should be cautious about intense physical exertion. Im really.worried, my resting heart rate is.over122 , im not active & overweight & want to start excersizing, but scared i get heart attack, should i b so worried? You should definitely begin with low-intensity exercise. High-intensity conditioning is only a good option for those who are relatively “healthy” and ready for it. Start out by taking brisk walks if that’s the level you’re at. And do some low-intensity strength exercise to build muscle, climbing stairs at a slow pace or slow, controlled push-ups on your knees. the most important thing is to find the exercises that are a good fit your your level and goals. As you acclimate, your heart rate will decrease, and you’ll be able to gradually begin doing high-intensity training. But don’t rush into it if you’re not ready. As Andy said, approach with caution! If I were you I’d go to a doctor and get checked out before trying anything too strenuous. There could be a serious reason as to why your resting heart rate is so high.